Silhouettes always have such a classy feel, but just because they are classic doesn't mean they have to be boring! This beautiful artwork is simple to make and customize for your style! With all of the scrapbook papers out there, the possibilities are endless. 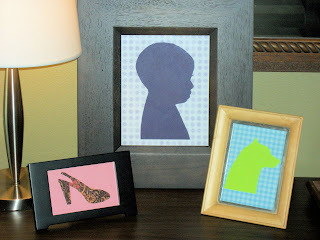 If you are creating the silhouette of a child, you know that it is impossible to get them to sit still long enough to trace around their shadow. So take a photo of their profile and upload it to your computer. Print it out onto regular paper at the size you would like for your finished picture. Color doesn't matter, it can be black and white. Cut around the profile of your photo. Use this template and trace it onto your scrapbook paper. I found solid color paper helps for the details to show up better than prints, but be creative. Also consider which way you want your profile to be facing before tracing. 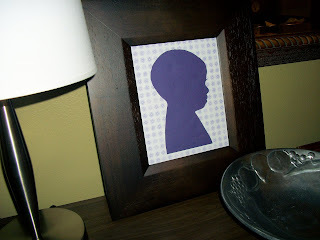 Cut out your scrapbook paper silhouette and glue it on to the background paper. I used a coordinating print as my background. You are now ready to place your silhouette in your frame! Be sure to mark your art with your child's name and age. It would be fun to do these each year as you watch your child grow! Don't have kids? Try this technique with your pet or any of your favorite things! How about those fantastic heels in your closet! Everyone has their own babies! Create animal outlines and frame a group of them for your childs wall. Search for pictures on the web and then follow the steps above. These also make great grandparent gifts!